You’ve got a video of a very specialised fix that you want your customer to see but nobody else. You’ve got a manual that’s just too big for email, or a software upgrade for a device that can’t and won’t be sent by email, what do you do? Sharing videos, photos and files on the internet is often one of the biggest problems that resellers and online traders can face. Email programs only allow a certain size or type to be uploaded (even the very flexible Gmail), YouTube is just a bit too open for people and you don’t want to be giving out your IM address to everybody so sending it via Skype/Gtalk is often out. Thankfully there are several ways to get files to customers, regardless of the size and file type your sending. Below are all the ways that you can get files to the people that need to read them with the minimum of fuss. You’ve quite possibly sourced media from 4shared.com, but did you know that its possible to share it via there as well? Setting up a free account is easy as all you need to do is to give them an email address and a password and free accounts come with 10GB of storage space. Once a file is uploaded it can be easily shared by taking the link from the file, or the relevant folder, and then giving it to the recipient in question. To see this video camera in action without compression visit 4shared.com/dir/30856663/c4ffcf3d/Raw_Videos.html by pasting that link into your browser. While email providers won’t allow you to send files larger than 25MB it is still possible to compress it by using WinZip or RAR and then attaching it that way. You can then email the file to your recipient. It is worth remembering thought that compressed files are a favorite way for virus makers to spread their viruses so the recipient needs to trust you before they are likely to open up your compressed file. There’s also a risk that you will be compressing with Winzip what they are trying to unpack with WinRAR. 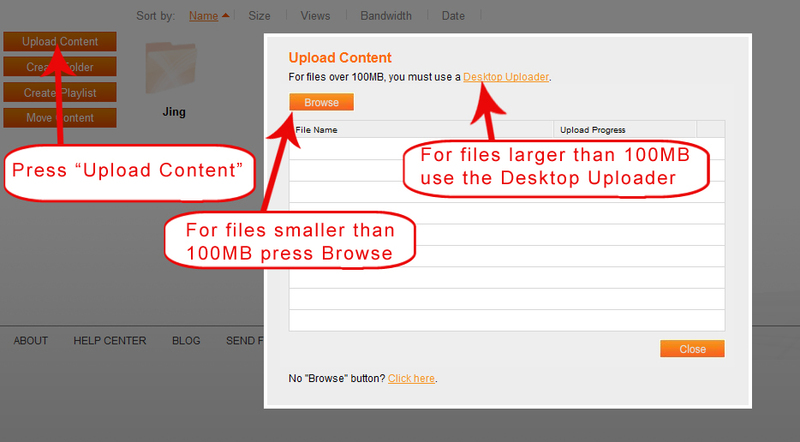 Megaupload.com offers a free file sharing service. You have to become a member to share files with multiple people and while there is 200GB of online storage available it’s not as user-friendly as 4shared. If you’ve created a Chinavasion account before you’ll be able to set up a megaUpload account without too much difficulty. If you’re just sending the one file to the one person there is no need to set up an account and you can use it like yousendit.com (with less restrictions). There’s a picture walk through below (just click on a picture to make it larger). Just make sure that you hit the advanced upload button, before filling in the details otherwise there’s a chance the system won’t upload your file. While it does require a download Dropbox is the darling of Technorati and online workers alike due to it’s ease of use and fairly stable nature. Essentially it allows you to share folders with certain people and also give URLS of videos that you can send (although it is questionable how well this function works). However, when it comes to transferring files between customers you can trust enough to give acess to a file on your computer there is quite possibly nothing that is as fast. It’s almost like the good old days of P2P network sharing at times. Screencast.com operates a lot like Megaupload.com. 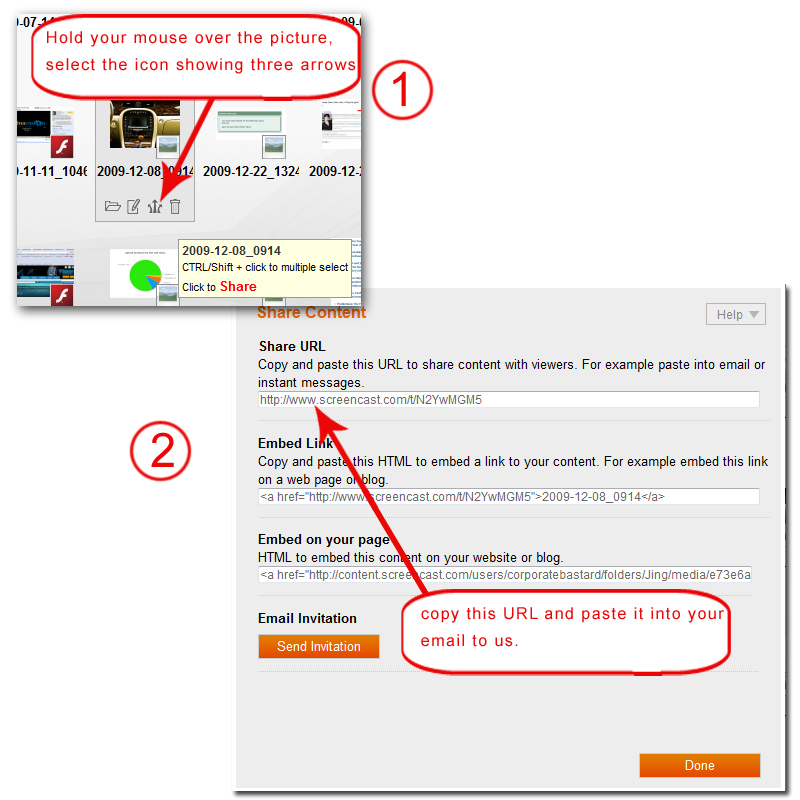 Like Megaupload you shouldn’t have any problems setting up an account with screencast.com if you’ve set up an account with Chinavasion however, you may find the upload and sharing process a little easier with the uploading and distributing broken into two distinctive steps. The fist thing to do is to log in and click on the ‘my library’ link on the main page (just click on a picture to make it larger). Then once you’ve done that go to your image folder and you should see your file. Hold the mouse over the picture and you will see the buttons you need. What’s also cool about Screencast is that it works in tandem with a program called Jing which makes movies and pictures of your screen and allows you to share them. So it becomes an easy process to share tips and lessons online. Yousendit acts like a limited Megaupload but comes with the advantage of having a sligtly more professional ‘name’ for itself. You won’t be able to send videos or sound files but you should be able to send document and picture files without too much difficulty. The free version of the service only keeps files on its system for seven days, allows you to send the file to one person and just allows 100MB to be uploaded at a time but it can be a useful tool to have in a jam. So, as you can see, distributing those files isn’t so hard after all. Check out these options decide which one is best for you and let us know if there’s any better services that we left off the list in the comments below. What a nice thing for you to do. So few know of these sites and have no idea how to transfer large files or how to store off site. Very informative but I know that the Chinese web does not allow access to FTP sites outside of the country. I know that at least one of these services does not work in in this case. Is there a back-door method other than e-mail to send large files to China?